According to the estimations of the researcher Aleksandr Vashchilko, based on a model outlined in Ossa (2014), these trade wars led to an increase in the trade flow through Belarus and thereby an increase of its tariff revenue. At the same time, because of a ban on imports in the sectors of meat and dairy products, the tariff revenue of Russia declined. As a member of the Eurasian Customs Union (EACU), Belarus can only claim a fixed portion of its total tariff revenue. Since the decline in the tariff revenue of Russia led to a decline in the total tariff revenue of the EACU, there was a decrease in the after-redistribution tariff revenue of Belarus. As a result, Belarusian welfare decreased. To avoid further welfare declines, Belarus should argue for a modification of the redistribution schedule. Alternatively, Belarus could increase its welfare during trade wars by shifting from being a part of the EACU to only being a part of the CIS Free Trade Area (FTA). If Belarus was only part of the CIS FTA, the optimal tariffs during trade wars should be higher than the optimal tariffs without trade wars. The optimal response to the increased trade flow through Belarus is higher tariffs. Following the political protests in 2014, Ukraine terminated its membership in the CIS Free Trade Area (FTA) and moved towards becoming a part of the EU. 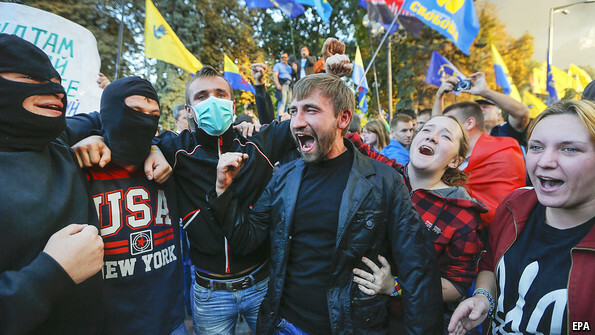 The political protests evolved into an armed conflict and a partial loss of Ukrainian territory. These events led to Western countries introducing sanctions against some Russian citizens and enterprises. In response, Russia introduced a ban on imports from EU countries, Australia, Norway, and USA in the sectors of meat products, dairy products, and vegetables, fruits and nut products. In addition, both Ukraine and Russia increased the tariffs on imports from each other in the above-mentioned sectors. Clearly, the trade wars affected directly involved participants such as the EU countries, Russia, and Ukraine. At the same time, countries like Belarus that were not directly involved in the trade wars, were also affected because of international trade linkages. It is important to understand the influence of trade wars on none-participating countries. To address this question, a framework with many countries and international trade linkages will be utilized and I will in this policy brief present some of my key findings. To evaluate the effects of the trade wars, I use the methodology outlined in Ossa (2014). This framework is based on the monopolistic competition market structure that was introduced into international trade by Krugman (1979, 1981). The framework in Ossa (2014) allows for many countries and sectors, and for a prediction of the outcome if one or several countries changes their tariffs. Perroni and Whallye (2000) and Caliendo and Parro (2012) present alternative frameworks with many countries that can also be used to estimate the welfare effects of tariff changes. The important advantage of the framework introduced in Ossa (2014) is that only data on trade flows, domestic production, and tariffs are needed to evaluate the outcomes of a change in tariffs, though the model itself contains other variables like transportation costs, the number of firms, and productivities. It should also be pointed out that the framework in Ossa (2014) is not an example of a CGE model as it does not contain features such as investment, savings, and taxes. Since the framework in Ossa (2014) is simpler than CGE models, the effects of a tariff change can more easily be tracked and interpreted. On the other hand, this framework does not take into account spillover effects of tariff changes on for example capital formation and trade in assets. The data on trade flows and domestic production come from the seventh version of the Global Trade Analysis Project database (GTAP 7). The data on tariffs come from the Trade Analysis Information System Data Base (TRAINS). The estimation of the model is done for 47 countries/regions and the sectors of meat and dairy products. According to my estimations, because of the ban on imports by Russia, the trade flow through Belarus increased. Belarusian imports of meat products are estimated to have increased by 28%, and imports of dairy products by 47%. Such increases in imports mean an increase in the tariff revenue of Belarus. It should be pointed out, however, that the model only tracks the effects of the ban on imports in the sectors of meat and dairy products. An alternative way would be to construct an econometric model that takes into account different factors influencing the trade between the countries. The effects of the decrease in the price of oil and the introduced ban on imports, which happened close in time, could then have been evaluated. The estimated model further predicts that, because of the ban on imports, the tariff revenue collected by Russia in these two sectors has decreased by 53%. This means that since Belarus can only claim a fixed portion (4.55%) of the total tariff revenue of the EACU, its after-redistribution tariff revenue collected in the meat and dairy product sectors declined by 44.86%, in spite of its increase in before-redistribution tariff revenue by 35%. The decline in Belarus’ after-redistribution tariff revenue is thus estimated to have led to a decrease in welfare by 0.03%. To prevent such a decrease in the future, Belarus should argue for an increase in its share of the total tariff revenue of the EACU. Furthermore, in addition to the decrease in the tariff revenue, the estimated model predicts that the real wage in Russia decreased by 0.39%, and its welfare by 0.49%. The introduced ban on imports also affected the European countries that used to export to Russia. The model predicts that the welfare of Latvia declined by 0.38% and that the welfare of Lithuania declined by 0.27%. A substantial portion of the decline in welfare of these countries can be explained by a decrease in their terms of trade. The introduced ban on imports by Russia led to a decline in prices in the countries that exported meat and dairy products to Russia. Lower prices led to a decrease in the proceeds from exports collected by EU countries, and lower proceeds from exports buy less import, implying a decrease in their welfare. In spite of the increase in tariffs between Russia and Ukraine, the model predicts an increase in the welfare of Ukraine by 0.23% following the formation of the EU-Ukraine Deep and Comprehensive Free Trade Area (DCFTA). An increase in real wages by 0.34% is the main factor contributing to this welfare increase. This is because it is associated with a redirection of Ukrainian exports from Russia towards the EU. The predicted increase in real wages in Ukraine have not materialized so far, presumably because of the ongoing military conflict and because time is needed to redirect the trade flows in response to the changes in the tariffs. While bearing in mind that the analysis is only based on the sectors of meat and dairy products, Belarus could have increased its welfare during the trade wars if it had shifted from EACU status back to CIS FTA status with tariffs set at before-EACU levels. In this case, Belarus would not have needed to share its tariff revenue with other countries, and would then have increased its tariff revenue by 47.93% instead of the now predicted decline by 44.86%. Similarly, the welfare during trade wars could then have increased by 0.05%, instead of the now predicted decline by 0.03%. Another advantage of moving to CIS FTA status during trade wars is that the real wage could have increased by 0.04% instead of the 0.003% in the case of continued EACU status. Belarus could further have benefitted from moving to CIS FTA status by choosing optimal tariffs. This study suggests that the optimal tariffs of Belarus under CIS FTA status with trade wars are higher than the optimal tariffs under CIS FTA status without trade wars. Higher tariffs is the optimal response to the increased trade flows through Belarus resulting from trade wars. Although it is optimal to move to CIS FTA status during trade wars, it is optimal to move back to EACU status after the trade wars are over. Therefore, such a policy should be adopted with caution, since the shift back to EACU status will likely not be possible. If it is expected that the trade wars will continue for a long period of time, or if the other members of the EACU will often deviate from the common tariffs, a transition to CIS FTA should be adopted. At the same time, asking for an increase in its share of total tariff revenue of EACU is a feasible strategy for Belarus to follow. While estimating the effect of a transition from EACU status to CIS FTA status for Belarus during trade wars, the evaluation was done using two sectors affected by counter-sanctions. To evaluate the full welfare effect of this transition, its effect on the other sectors of Belarus should also be estimated, which is a question for the further research.